Across the globe from America's biggest cities to small villages in India, buses are absolutely vital to how people get around. But sometimes, things don't work out as planned. Due to driver error, bad roads and bridges, poor weather or any number of other factors, buses can experience sudden changes in altitude that can leave their passengers badly wounded or even dead. When you read about it in the news, this situation is known as a "bus plunge." And make no mistake — it is always a "plunge," and a never a "fall," a "drop," a "plummet" or some other word. Buses plunge, and that's all there is to it. Today, I'm about to let you in on one of journalism's least well-kept secrets: the bus plunge story. Any time you read about a bus leaving the roadway and falling to one degree or another, I can guarantee you that nine times out of 10, the word "plunge" will be used, especially in the headline. A search on Google News reveals recent bus plunges in San Antonio, Los Angeles, China, New Delhi, Nepal and Peru, just to name a few. A search of the AP's image archive, where I found the photos in this story, yielded some 700 results. Even Jalopnik has made use of the term in our stories. Oh, a bus can "crash." Make no mistake about that. It can also be involved in a "wreck," a "collision," or an "accident" (although I myself don't care for that word because it implies no fault or intent.) These all happen on level ground, however. Whenever altitude is involved — even when the bus goes a few feet off an embankment — it's a "plunge." I also like the term "careened off," but I don't make the rules. How did this come to be exactly? How did journalists who are spread across the world come to use this one word as the standard for buses that experience elevation changes? Here's the thing about newspapers: they can't publish blank space. You've gotta put something in there. So editors started putting in lots of "bus plunge" briefs because they were short, simple, and filled space easily. They typically came in from foreign bureaus or wire services because that's where these types of crashes were most prevalent. 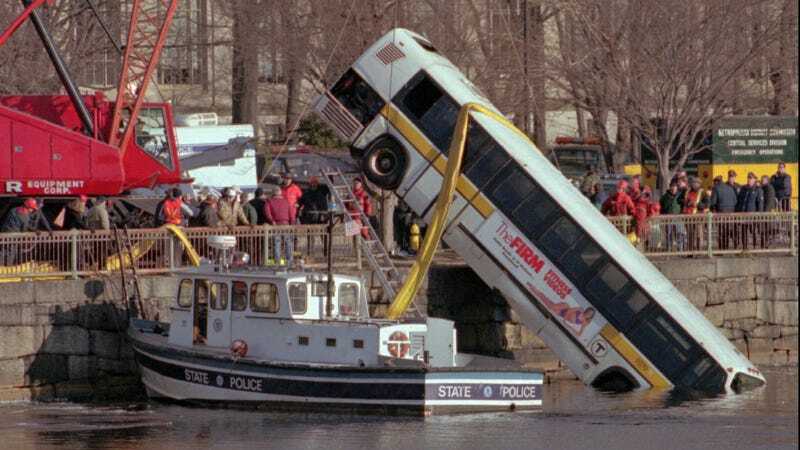 The "bus plunge" stories became popular because they were, essentially, filler. A few years ago, Slate published an excellent and extensive article on the bus plunge phenomenon. MATTAIELE, Union of South Africa, March 5 (Reuters)-Fifteen Africans were killed and thirty others were injured today when a bus careened out of control off a cliff near the Mabusa mission station, about fifteen miles from here. Plunge should appear in the hed; the piece should be only a couple of sentences long; and it should "include the number feared dead, the identity of any group on board"-a soccer team, church choir, or students-"as well as the distance of the plunge from the capital city." The words ravine or gorge should appear. These types of stories were especially popular in the 1960s and 1970s, but they've kind of declined since then. Technological changes on the production side of newspapers meant a huge plethora of briefs were no longer as necessary as before. You simply don't see them as much as you used to. In addition, newspapers aren't what they used to be these days. Budgets have been reduced. Pages have shrunk in size and content. Foreign bureaus have all but disappeared. As a result, you tend to see fewer bus plunge briefs in the pages of national newspapers. But the term survives, and as we've seen before, "bus plunge" has grown to encompass this kind of accident, no matter where it gets published — including the web. So the next time you're browsing the news online, watching TV or reading a newspaper and the term "bus plunge" comes up, you can consider yourself in on the secret. What do you think of the bus plunge? Have you ever seen one or been involved in one?